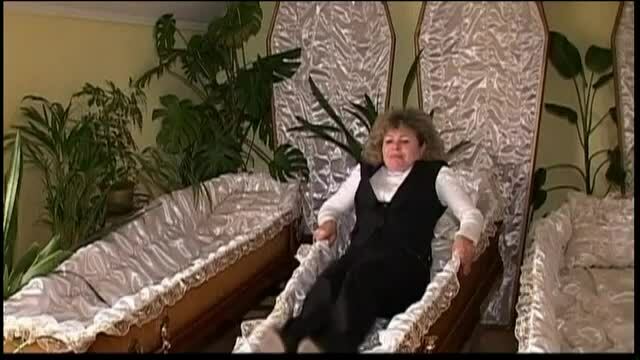 Reuters, February 3, 2013 -- A Ukrainian coffin maker is helping potential customers get comfortable -- but not too comfortable. Stepan Piryanyk, an enterprising funerary box maker in Truskavets, offers afterlife-fearing patrons the opportunity to rest in peace with a session of coffin therapy. "At one time our parents, as a rule, kept a coffin in the attic. Then our grandma -- who didn't have an attic -- came to us because she lived in an apartment. She asked us to make something that she could put in her apartment. So we decided to make her a coffin couch. You lay down on it in the evening and slowly get used to eternity." Customers relax with the lid open or closed -- their choice -- and leave in a peaceful state of clarity and bliss. Hopefully. "After a hard working day you can come in and just relax -- it's great. You go home in a completely different mood," Anna Petrukhina, 51, told Reuters. The BBC reports that each session costs $25 while other outlets say the treatment is free. Either way, everyone ends up a customer eventually. 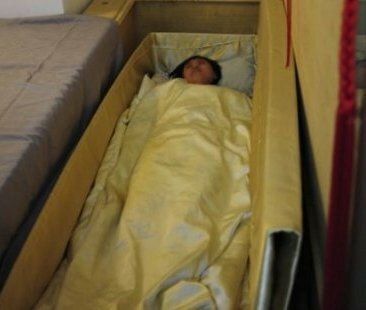 A new form of therapy in China has patients lie in coffins in order to relieve their stress, as a group of volunteers are participating in the act as a special form of experimental psychotherapy. Tang Yulong, a consultant of the psychological counseling center, says people who suffer from psychological problems can be helped by simulating death. This can help one come out of the coffin as a new person. Patients climb into a coffin, pull a white blanket over themselves and stay still. Before they are “reborn” they are required to write down their last words. Five minutes later, a sound of a baby crying breaks the silence and the consultant opens the coffin with a cheery tune. More than 1,000 people have tried this special psychotherapy so far.